Not many of the changes in Windows 8 Task Manager are obvious, but there are definite improvements. See which features are worth another look. The Windows 8 Task Manager still launches when you strike the Ctrl-Alt-Esc key combination, and it's still very much available in Desktop view by right-clicking inside the taskbar. 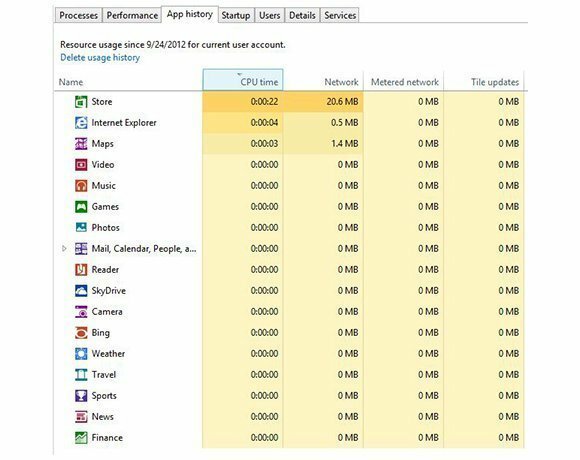 But what Task Manager shows you and how it works are very much changed in Windows 8. 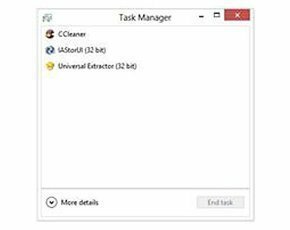 And unlike other aspects of the new operating system that have drawn ire and frustration from users, the new and different features in the Windows 8 Task Manager are almost unanimously regarded as improvements. Figure 1. What the Windows 8 Task Manager looks like with no apps open. 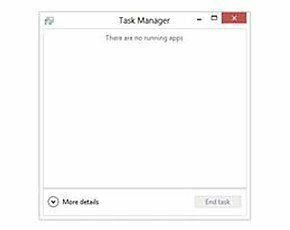 All claims of improvement aside, you're in for an underwhelming experience the first time you open Windows 8 Task Manager. The following screenshots (Figures 1 and 2) show what you're in for, depending on if you have any applications open or not. Figure 2. Three apps are shown as open. 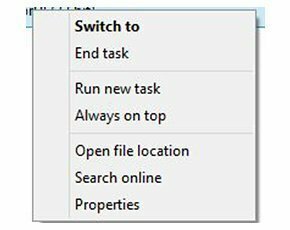 If you have applications open, you can right-click them in the Task Manager pane to elicit the options shown in Figure 3. You can use the Switch to item in the dropdown menu to bring the currently selected application instantly to the foreground, while End task causes that application to exit. Figure 3. Right-clicking an open application produces this menu. The Open file location and Properties selections open Windows Explorer in the home directory for the selected item or the Properties window for that item, respectively. The Search online option opens Internet Explorer with search results using the application's file name as it appears in Windows Explorer. This can be handy when you are trying to figure out where unexpected or mysterious items come from, or what kinds of potential hazards they might pose. Things become a great deal more interesting -- and informative -- when you click the "More details" arrow that appears at the lower left in Figures 1 and 2. This produces the much busier multi-tabbed layout on display in Figure 4. By default, the Processes tab is selected so that's where we pick up this guided tour. Figure 4. The Processes tab provides lots of information for all currently active Windows 8 processes. 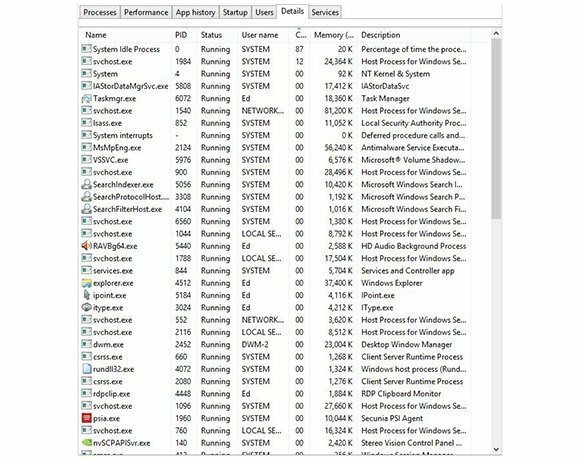 There's never any need to launch anything to force Task Manager to produce items in this view because it includes all open applications (both Modern-style apps and desktop applications) as well as all active background processes by default. Earlier versions of Task Manager forced users to click the "Show processes for all users" button to show processes with IDs not identical to the current logged-in user ID; the Windows 8 version shows all processes by default. 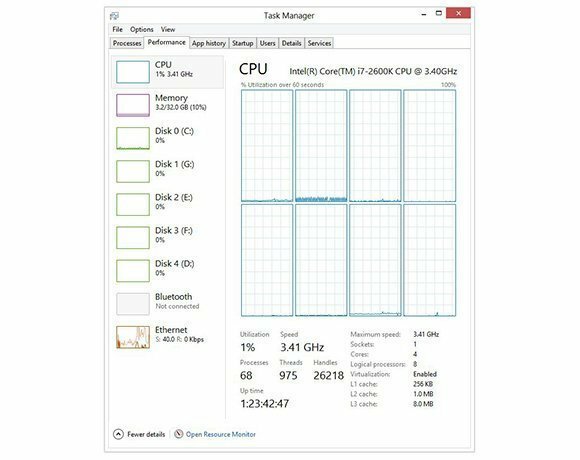 In addition, as the right-hand columns indicate, for each process, Task Manager shows consumption of CPU, Memory, Disk and Network resources in a single consolidated view. This is much more convenient -- and informative -- than earlier Task Manager versions, which did not provide network or disk resource info per process and which always used the process filename for identification. The closest thing to this view you'll find in Windows 8 is the Details tab, covered later in this story. Furthermore, items with a triangle at the far left represent aggregate values for subsidiary processes, more than one of which may be active at any given moment. Security improves in Windows 8, but by how much? Apps (n): Provides the total count for apps including both desktop applications and Modern style, or Metro user interface (UI), applications by name. Background processes (n): Gives the total count for processes not associated directly with apps and not considered part and parcel of the Windows 8 operating system. Windows processes (n): Provides the total count for processes that are considered part and parcel of the Windows 8 OS. 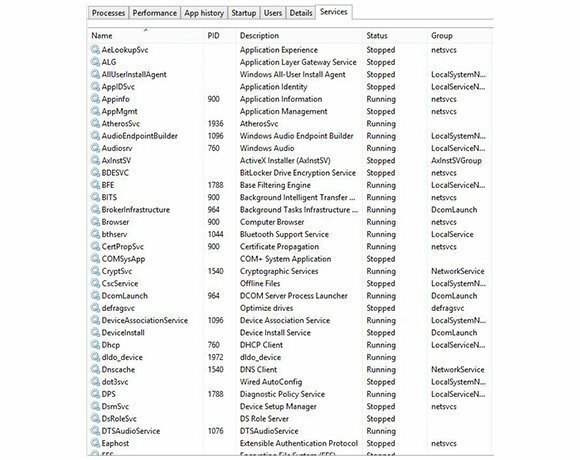 A very handy feature here is that expanding the Service Host entries finally provides an easy way to see which Windows services are associated with each instance of svchost.exe. 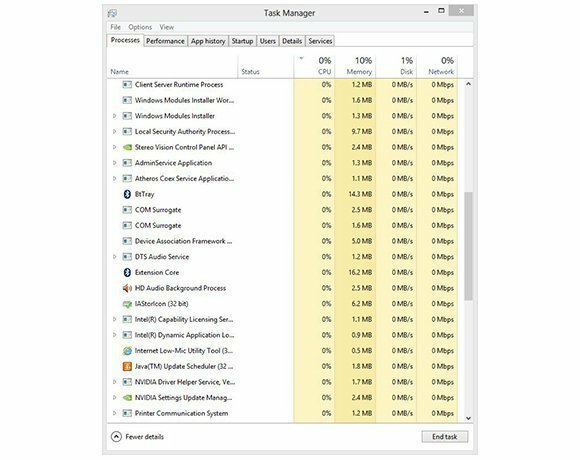 The Performance tab in the Windows 8 Task Manager provides a single-pane display of uses for CPU, memory, disk and networking interfaces on the target Windows host machine. Figure 5 shows its capabilities and the information it conveys. Figure 5. The Performance tab displays the level of utilization per logical processor. Clicking items in the left column brings up detailed displays in the right-hand display pane. For example, you could click Memory at the left to get memory consumption details on the right, and so forth. This is handy when digging into system resource consumption, perhaps when trying to figure out why performance for some subsystem (often disk or Internet access) is slower than usual. Figure 6. Notice all the "zero" values for the vast majority of Windows 8 Modern-style apps. The App history tab shows resource consumption for Modern-style (Metro UI) applications only. For those who live in the new Windows 8 UI, this information is very helpful. For users like me, who primarily work on the desktop, it mostly shows how little I actually use the native Windows 8 UI. Figure 7. 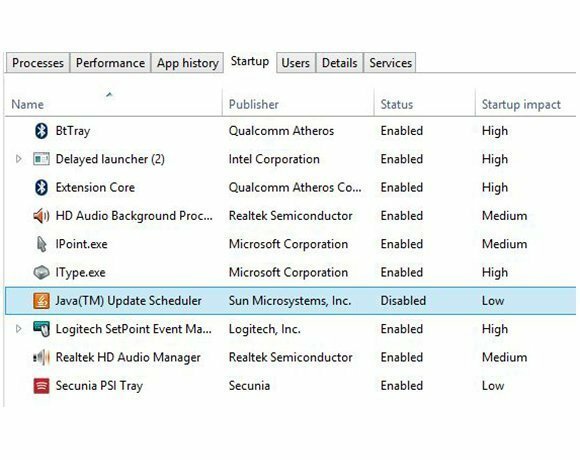 Startup items may be inspected and managed in Windows 8 Task Manager. The Startup tab in Windows 8 Task Manager is more or less equivalent to the Startup tab in msconfig.exe (System Configuration) in earlier Windows versions. You can use it to observe the items that are loaded on startup, and you can right-click any item to enable or disable it. In Figure 7, I've disabled the Java Update Scheduler on my system because Secunia PSI cheerfully informs me whenever an update needs to be applied, so jusched.exe isn't really needed. The Users tab lets you examine resource consumption on a per-user basis. This is handy on a system where multiple logins may be active at the same time because it lets you observe which account is using which resources. This is the tab that hearkens back to previous Task Manager versions (their processes tab) most closely. It shows a column for process IDs (PID), associated user name (owner), CPU utilization, memory consumption and a description provided by the developers for each entry. Figure 9. Maximum process details and information are listed in this details view. The "Search online" right-click option is available in this view as well, and this is a handy tool to look up strange, mysterious or unexpected processes online by the value in the Name column. In the past, admins had to load third-party utilities to automate this kind of thing, so it's a nice built-in feature for Microsoft to provide. Figure 9 shows a busy but informative listing of items, sorted by CPU utilization. You can sort on any column by clicking on its top-line label, where the arrow over the center column indicates the sort direction: up for increasing and down for decreasing. Figure 10. The Services tab lists Services in alphabetical order by name. The Windows 8 Task Manager even provides limited access to Windows Services and easy access to the Services control panel applet for complete controls via a button labeled "Open Services." Users can stop, start or restart services here, and the "Search online" right-click menu option allows them to check things out online as well. Figure 10 shows an alphabetical list of services by name. There's nothing terribly earth-shattering about the changes and enhancements to Task Manager in Windows 8. 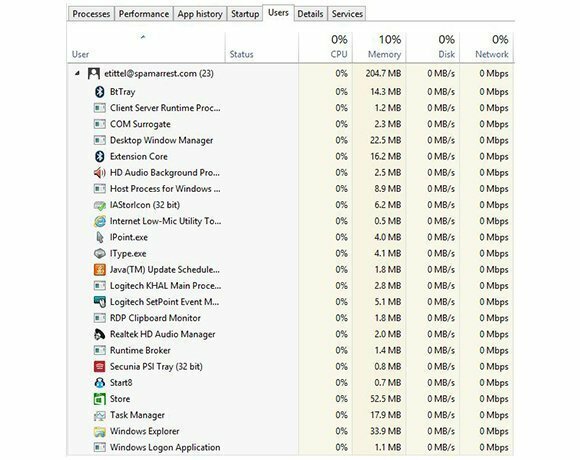 But easy access to online information, lots of resource and performance details, and direct control over startup options in this version of Task Manager make basic monitoring and management much easier than in earlier Windows versions. There really is a lot to like in this humble utility, and savvy Windows 8 users who explore and learn its various features early on will come to appreciate it. Not impressed by Windows Hate Task Manager at all. The claim is that you have direct control of startup apps etc, but the only control you have is whether they are enabled or disabled. Where's the ability to delete them? Well, by and large, Windows 8 as well as 8.1 amounts to a needlessly mean- spirited harassment of Windows XP and Win 7 users. 4) Rename items like "menu" and "shortcut" with names like "charms" and "tiles". Why ? 5) Provide flickering and distracting tiles with the most godaweful clashing colors imaginable. 6) Hide "Control Panel", hide Windows Explorer, hide umpteen more things. 7) Put only a part of the items from "Control Panel" in the new "Settings charm", while hiding the rest away and refusing to say where they are. 9) Disable functions that were standard for many years - play a DVD, well Microsoft says no, it's not good for you. 10) To make a program that was heretofore flexible and customizable by the user, into an inflexible, "Window replaced by brickwall nightmare". 11) Replace an obvious "Eye-level One Click" function with one that requires "Click, Type, Search, Search again, click, find, search, click, click again"
market. It would have been EASY to give users in both markets what they want, but no, Microsoft does not understand "customer service". possible, and if Microsoft has not come around by then (say in 2017) with an "apology for being disruptive to the point of stupid" and with a "complete reworking of Win 8" that brings back the deleted, hidden and destroyed functions and abilities, then I have to finally say good bye to MS Windows. MS money-dream goes poooof!! Gone! love xp. Can I delete windows 8 and get xp on my new hp 110-014?